The escalating hostilities in southwest Syria endanger some 750,000 people - almost half of them children, like these boys pictured here, who have fled violence in Deraa. Attacks against children caught in the conflicts in Syria and Yemen must stop, the UN children’s agency, UNICEF, appealed on Monday. In a tightly worded statement, UNICEF pointed out that since Sunday, 28 children were reported killed in Idlib and western Aleppo, located in northern Syria. The death toll included an entire family of seven. Furthermore, three UNICEF-supported health facilities were also attacked, two of which are now out of service. “The war on children in Syria is putting at least one million children at risk in Idlib alone,” said the statement, attributable to Geert Cappelaere, UNICEF Regional Director for the Middle East and North Africa. These latest incidents follow the deaths of 21 children in Yemen last week, killed when their school bus was hit during an airstrike. For Juliet Touma, UNICEF Chief of Communications in the region, they represent an escalation in attacks on children. “There’s obviously a war on children,” she told UN News, explaining that ongoing fighting means children in the two countries are being deprived of basic rights such as access to healthcare and education. The Syrian crisis began nearly eight years ago with civilians continuing “to bear the brunt of a conflict marked by unparalleled suffering, destruction and disregard for human life,” according to the UN humanitarian affairs office, OCHA. UNICEF reported that more than five million children there require humanitarian assistance, with nearly half forced to flee their homes. 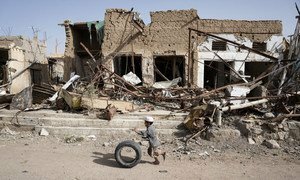 Meanwhile, the UN humanitarian affairs office, OCHA, said three years of fighting in Yemen means nearly two-thirds of the population requires some form of aid relief or protection support to survive. “Across the region there are about 30 million children who need humanitarian assistance,” Ms. Touma said, also referring to the situation in places such as Libya, Sudan and the Occupied Palestinian Territory. An air strike on a busy market area in Yemen that reportedly killed scores of people including more than 20 children on a bus, is likely the worst attack on youngsters in the conflict so far, and the latest in a recent spate of violence targeting civilians, UN agencies said on Friday.